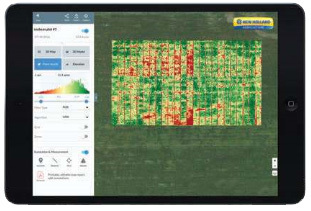 When it comes to making effective, cost-saving decisions for your operation, PLM Drone Data Management gives you the tools needed to make timely agronomic decisions. Crop scout to detect plant health problems: Drone mapping helps pinpoint the location and extent of plant health issues, which are illustrated through the DroneDeploy dashboard. Plant counts and stand establishment: Drones can help compile automated plant count reports of entire fields. Stand establishment of newly planted crops can also help growers decide whether they need to replant certain areas. Generate variable-rate prescriptions: Drone-generated shapefiles from DroneDeploy can be exported into popular farm software to assist with creating variable-rate prescriptions for nitrogen, pesticides, and other targeted nutrient applications. Negotiate fair crop loss percentages: Annotated crop health maps help users with insurance requests and recouping crop losses. Assess and clean up after natural disasters: Drone maps can help estimate the extent of storm or tornado damage, and even help when clean-up is needed. A drone map can spot hidden debris, enabling users to plan for more efficient removal. Water Management Assessment: Drone maps can assist in planning for drainage tile placement and help assess a water management system’s effectiveness. New Holland has collaborated with DroneDeploy® to provide you with UAV Software that is innovative, industry leading, and easy to use. To ensure that your drone is never grounded, we offer support by email, phone, and live chat, giving you the choice of the support style that is most convenient for you. Contact Ag Technologies (1268 E 100 S Rochester, IN 46975) at 574-223-8324 for more information!